Great news! Green BEAN Delivery is offering a coupon to readers of myweeklybite.com for $15 off of your first Green BEAN purchase (almost half price on some bins!). Use the code, 15MWBml, when checking out to receive your discount. The offer is good until May 9, 2014. For a little chan ge of pace, I thought I would share some information about an amazing produce delivery service I have started using called Green Bean Delivery. This amazing company strives to build upon local food systems by providing an alternative to grocery stores. They deliver organic produce and local artisan products right to your door at a schedule of your choosing. This service is offered in select cities in Indiana, Ohio, Kentucky, and Missouri and local farmers are used whenever possible. The food is delivered in a green plastic crate with reusable packing materials and ice packs, with each area of the city having a different delivery day. When your delivery day arrives, simply leave your [empty] box outside and it will be swapped with a new container. An e-mail containing a list of items to be delivered precedes each drop off. You then have the option to edit the amount and type of produce you would like to receive. For items that you would like to be delivered regularly, you have the option to create a standing order. Since my husband and I are typically the only people eating at our house, I have opted for the small produce bin to be delivered every other week. 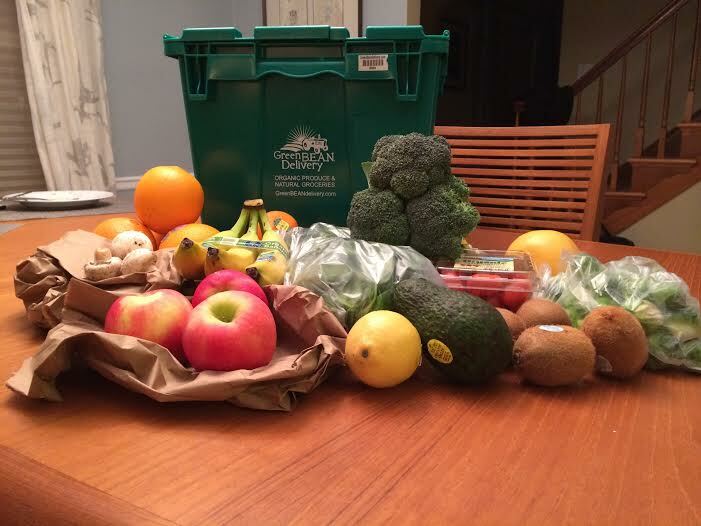 To get an idea of what comes in a bin, this week I received spinach, brussel sprouts, apples, bananas, clementine oranges, mushrooms, broccoli, grapefruit, a lemon, an avocado, kiwi, and navel oranges. There are so many great things about this service. I have found that we really only need to go to the grocery store for protein and dairy items. This has forced me to plan meals a little better which helps me save time and money. This type of food delivery service is also good for those of you who are looking to spice up your meals. Not sure how to prepare your new foods? Don’t worry, the website comes complete with serving suggestions and recipes for foods which you may not have prepared in the past. Another benefit that I have noticed is I am more likely to munch on fruits and vegetables since my refrigerator is always fully stocked. I feel like I am doing my body (and my waistline) an additional favor by choosing fresh, organic products.